Models of snow melt are needed for regional-scale hy-drological applications such as hydroelectric power generation, flood hazard, and water resources forecasts. They are also necessary for modeling of cryospheric interactions with the climate system and global cryo-spheric response to climate change. where PDD is the positive degree day total over time t (measured in units °C • d), b is an empirically determined melt factor, and H(Ta) is a Heaviside function, equal to 1 when Ta > 0°C and equal to 0 when Ta < 0°C. This relationship works surprisingly well in estimating monthly or seasonal snow and ice melt, as long as b is appropriately tuned for a site. The explanation for this is that the main sources of energy that drive melting—solar radiation, incoming longwave radiation, and sensible heat flux—are all strongly correlated with near-surface air temperature. Longwave radiation and sensible heat are proportional to air temperature, and diurnal cycles of air temperature are broadly driven by shortwave radiation. Degree-day melt models avoid the intensive meteorological data that are needed for energy balance calculations, requiring only air temperature as an input. Air temperature is believed to be relatively simple to extrapolate from remote point data or large-scale model data, using atmospheric lapse rates to account for elevation effects. However, both melt factors and lapse rates vary spatially and temporally, and degree-day models are far removed from the physics that describes the melt process. They can perform poorly when not locally calibrated or when applied to short timescales (e.g., hourly or daily melt). where a and b are empirical parameters. An obvious weakness of (4.5) is that it does not account for the true absorbed solar radiation at the snow surface, which can deviate a great deal from the potential direct radiation as a result of cloud cover and fluctuations in surface albedo. These effects are embedded in the parameter a, and (4.5) can be rendered more physically based by explicitly building in temporal and spatial variations in surface albedo. It is also possible to derive regional cloud cover indices from satellite imagery or climate model diagnostics, allowing the first term in (4.5) to be replaced by an estimate of the absorbed radiation, QS* (1 — as), which directly governs snow melt. Alternative simplifications to the full surface energy balance have also been adopted, and improvements in mesoscale climate models as well as satellite observing systems are creating the possibility for a more physics-based approach in regional and global-scale snow-melt models. However, there is a perpetual trade-off between physics-based approaches, which use artificial, potentially flawed meteorological input data, and empirical models, which have more reliable input data but are missing some important physical processes. Empirical models are not very portable in space or time, so they are dubious for high-resolution distributed models and for future projections; the research community is therefore driving toward a more complete and faithful representation of the surface energy balance. Meltwater remains part of the snow or ice system until it runs off. Meltwater can refreeze in a snowpack or it can be stored for days to weeks in the liquid phase, delaying runoff to river systems. The seasonal snowpack is sometimes called a "snow aquifer" for this reason. A small amount of liquid water content increases the viscosity and cohesion of the snow, giving "packing snow" that is ideal for backyard snowmen. Snowpacks retain liquid water contents of several percent in the pore space before they become saturated and turn to slush. Once saturated, gravity will triumph over surface and capillary tension, allowing water to drain through from the snowpack. Drainage is essentially Darcian: flow in a porous medium, driven by gravity and hydraulic pressure gradients. Percolation and drainage also occur in unsaturated snowpacks where vertical drainage channels, or "pipes," establish. Water that drains to the base of the snowpack can pond there, infiltrate into the soil and groundwater system, or run off as a surface (overland) flow. If the underlying ground is frozen or in the case of a supraglacial snowpack, the snow rests on an effectively impermeable barrier, and runoff occurs at the snow-ground or snow-ice interface. This is common in the early melt season; one hears the water running beneath a tenuous snow cover, and creek crossings on such a snow cover should be attempted with care. If there is a topographic slope (hydraulic gradient), meltwater can also drain as a surface or internal flow in a saturated snowpack. Most of the meltwater in subsurface and surface flows drains to regional river systems. This is relatively quick for overland flows (hours to weeks), but there can be delays of days, months, or even years for water that enters the groundwater system. Much more could be written about seasonal snow, and it will not stray far from our minds as we continue on with overviews of freshwater and sea ice, glaciers, and permafrost. All are heavily influenced by the seasonal snowpack; glaciers would not be here without snow, and snow insulates the other forms of ice from the atmosphere, playing a critical role in their growth, decay, and thickness. Heavy snow cover on a surface of lake or sea ice can even result in submergence of the ice cover, with flooding and subsequent freezing of the snow creating a coating with the doubly cryospheric name "snow ice." 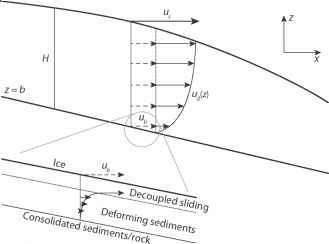 The rest of this chapter expands on this and other important aspects of lake and river ice.